In two previous posts, I looked at how we can use past polls and elections to shed light on what current polls tell us about the next election. Today, I’m publishing an update, on how to interpret polls one year before the election: less than a month from now. That is, on average, polling leads halve (whichever party is leading) and move 3.5pts in favour of the government in the 12 months before an election (the real-world logic of requiring these two steps isn’t obvious and there’s no suggestion they actually happen in this order – but it’s what the regression produces). This would suggest Labour’s current poll lead – 4pts – points towards a narrow Tory win on vote share at the election, of around 1.5pts. Again, this would probably put Labour as the largest party. Should you pay any attention to this graph? In its own terms, the model is fairy powerful: about 60% of the election result is predictable by the polls a year before the election (though with the polls predicted to be close, 40% is a lot). The confidence is good, at 0.02. But there are a couple of reasons to question the basic approach I’ve taken. Firstly: someone who, unlike me, actually knows what they’re doing, Steve Fisher at Oxford University, is now running a more sophisticated version of this approach, and his model comes out with a much more positive result for the Tories. The basic difference is, Dr Fisher’s model adjusts the current polls according to three things: parties’ tendencies to move back to their long-run average support, the expectation that governments will gain ground/oppositions fall back, and polls’ overestimation of Labour support. Mine just shows what the polls have done in the past, without adjusting them. 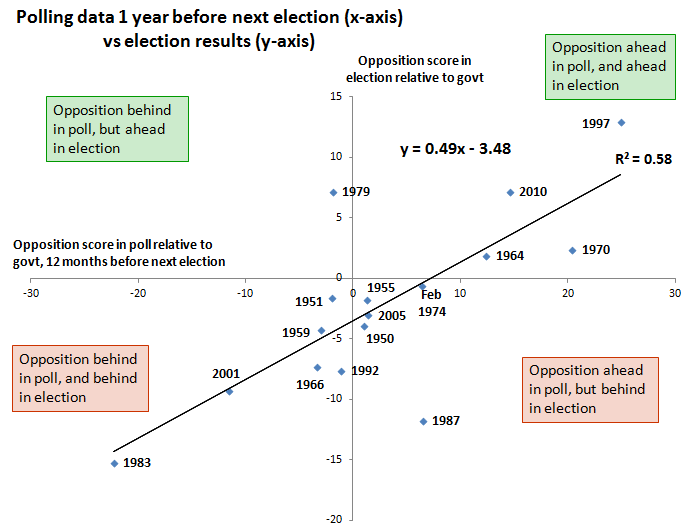 It seems to me that by including the tendency for parties to go back to their long-term average, as well as the way polls usually shift in favour of governments towards the election, Dr Fisher may be counting the same phenomenon twice and so over-estimating the extent that the polls will shift. If I’m right – though you might prefer to assume he knows what he’s doing and I’m not – there’s something to be taken from my cruder approach. Secondly: there’s a decent argument that historical polls just aren’t that useful for this particular election. Labour’s gain of a swathe of Lib Dem voters in late 2010 seems stable; the existence of the coalition will change the pattern of tactical voting; and Ukip will probably do more harm to the Tories than the others. I wrote about that all here. In my view, what we’ve got here is fairly useful – it tells us roughly what to expect in terms of direction and extent of poll movement over the next 12 months – but it still leaves plenty of space for the details to be worked out. The methodology’s the same as last time: I used Mark Pack’s poll data to compare opinion polls before the election with the result of that election. As before, where three or more polls were available in the relevant month (12 months before the next election), I took an average of all polls in that month. This means there’s a risk my results are skewed towards the agencies that do the most frequent polls. Where fewer than three polls were available, I used the closest three polls to the required date. This time I was able to include all post-‘45 elections, except October ’74, and I didn’t have to cut any from the regression – though taking out ’79 and ’87 would have made it a lot stronger (and would make Labour memories less painful). This entry was posted on Wednesday, April 9th, 2014 at 08:27	and is filed under Historical polls, Politics. You can follow any responses to this entry through the RSS 2.0 feed. Both comments and pings are currently closed. The massive problem you’ve got is that you cannot compare polls of the modern era (post 2001) with those before when there was a huge systemic bias to Labour. In the years after 2001 most pollsters introduced some sort of structure to ensure politically balanced samples and their performance at GE2005 was excellent. GE2010 was messed up by the Cleggasm. So you’ve only got two data points for a meaningful analysis. Hi Mike – thanks for commenting, I always enjoy your stuff. This is indeed one of the things that Steve Fisher corrects for in his model. You could say that what I should have looked at is how the polls stood 12 months before an election, compared with how the polls were when the election came. I’ve just had a quick check of the polls taken immediately before elections, and compared them with the results. I don’t think they show there’s always been a systemic bias to Labour. From my calculation, in 6 elections (’50, ’51, ’55, Feb ’74, ’83, ’10) Labour did *better* than the average of the polls immediately before the election. In the other 10 elections, Labour did worse. So there’s a skew in the polls towards Labour – but I don’t think the evidence is so strong as to say that it’s consistent and undermines the exercise. A bigger problem – and related – is the accuracy of the historical polls. If older polls weren’t very accurate, that would spell a problem for what I’m doing. I think this is indeed an issue, and while there might not be a consistent bias in the polls, it does add an extra reason to be cautious about the results. Other than the fact that people lie to pollsters, the main problem is that the election is won or lost by where people vote not the percentage of votes cast. In her second term Mrs Thatcher famously lost 2% of the vote but gained 52 seats. To improve the model it would be necessary to analyse the movement of effective votes across the marginal constituencies. Essentially, you have to track fewer than 200,000 votes across 40 – 70 constituencies to get anything like an accurate forecast.